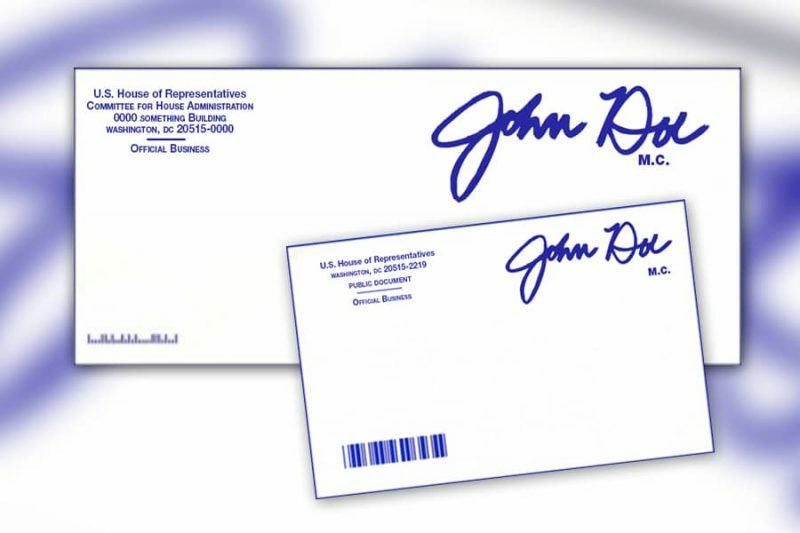 Franked Mail has a member of Congress’s signature in the upper right corner of an envelope instead of a postage stamp. The “blackout” period for Franked Mail mass mailings takes effect Wednesday, Aug. 8. Franked Mail is official correspondence sent by members of Congress and other authorized users. These mailpieces have the member’s facsimile signature — the frank — in the upper right corner of the envelope or label instead of a postage stamp. The frank includes “M.C.” (member of Congress) or “U.S.S.” (U.S. Senate). Members of Congress are banned from sending Franked Mail mass mailings 90 days before a general election. Mass mailings contain 500 pieces or more. The Postal Bulletin’s July 19 edition has more information about Franked Mail. This entry was posted in General Union Business, Postal Reform and Politics and tagged blackout period, facsimile signature, frank, Franked Mail mass mailings, M.C., members of Congress, official correspondence, pre-election ban, U.S. Senate, U.S.S.. Bookmark the permalink.